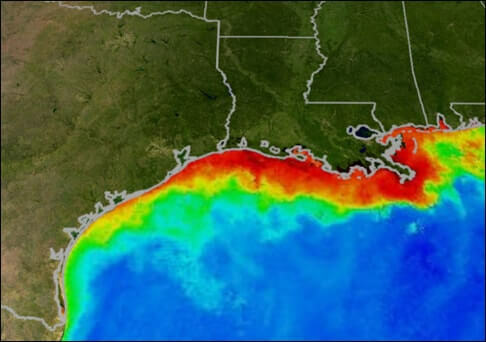 Dead Zones in the Gulf of Mexico are the growing larger every year with no end in sight! Many fishermen and folks who live along the Gulf of Mexico have been living in negative impact areas known as the “Dead Zones” resulting in human and animal health issues along with massive fish kills yearly. The dead zone occurs between the inner and mid-continental shelf in the northern Gulf of Mexico, beginning at the Mississippi River delta and extending westward to the upper Texas coast. From Michigan to Puerto Rico, streams, creeks and brooks carry an enormous load of pollutants such as synthetic fertilizers and nitrates. These oxygen and nitrogen molecules that crops need to grow eventually make their way into lake, rivers and oceans. This ends up fertilizing blooms of algae that deplete oxygen and leave vast dead zones in their wake. Sadly, these dead zones are carried into the English channel and are meeting other dead zones in international waters. There, no fish or typical sea life can survive. Indiscriminate use of synthetic fertilizers has resulted in groundwater polluting our gulf waters Dead zones and lifeless soils are created by conventional farming methods. Conventional NPK fertilizers contain excess nitrogen, phosphorus and potassium. In fact, most people around the world have high levels of nitrogen in their blood because of these poor farming practices. Unfortunately, the use of pesticides and conventional chemical fertilizers for long periods of time has had horrible effects on the health of our soils. These pesticides and conventional chemical fertilizers deplete soils of organic matter and nutrients; reducing the overall biological activity. If soils don’t have the necessary microbial and biological activity this will lead to less pathogen resistance. This means the soils will suffer from more plant diseases and crop decline. The solution to this problem is to use alternatives such as sustainable fertilizers and methods that build soils with mycorrhizal fungi, beneficial microbes and friendly bacteria. Our microbial helpers cause reclamation of soils while adding organic matter. This route would conserve natural resources and create fertile land, clean groundwater and ocean water. At Natural Green, we use this approach. It is important to us that we follow the correct procedures and minimize the negative impacts on our environment. Mycorrhizal literally means fungal root and describes a beneficial relationship between fungal microorganisms and higher plants. If you have ever found comfort in the shade of large tree or eaten a delicious strawberry, you have benefited from mycorrhizal fungi and friendly bacteria. If we ever want our soils, waters, oceans, animal and human health to thrive, environmentally conscience landscape practices need to be in our future! Soil scientists from around the globe are finally looking to biological sciences to find better, cleaner and more sustainable methods of growing crops and ornamentals. After decades of focusing exclusively on chemically oriented growing practices, there is hope on the horizon. One way that you can get involved is by using one of our natural and sustainable programs on your yard. Start healing the environment by using Natural Green today! 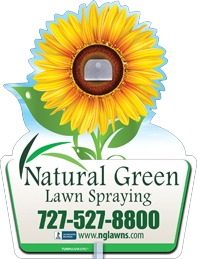 Copyright © 2017 Natural Green Lawn Spraying. All Rights Reserved.